I first posted this within my first month of starting….so no one but my family has seen it. I decided to update this because we make it often in the cooler months and have done so for more than 10 years. There are few better recipes to get your kids started on a lifetime love of good food from their own kitchen. I first started making this to help my sons learn how to cook. It is a fairly straight forward recipe that can be embellished as their cooking skills improved. The nice part is they didn’t have to cook the pasta on the stove. (So you didn’t have to worry about them draining boiling water into the sink) It has become one of their favorites. My oldest son, who is now living away from home, makes this for himself on a regular basis. 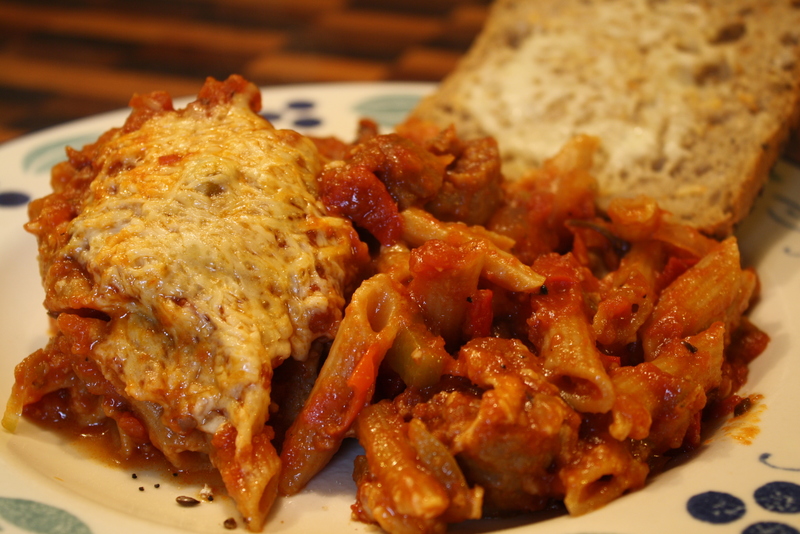 1 pkg of pasta of your choice (ziti, penne, rigatoni) Multi-grain pasta works well here. 1 8oz pkg of shredded Italian cheese. We like the 5 cheese mix, but just mozzarella works too. A five quart covered casserole dish. Next-the embellishments you can add as their skills (and taste buds) mature. 8 oz of mushrooms of your choice-you can start with pre-sliced and move to whole as they get better with the knife work. 1 tsp dried oregano or Italian seasoning. Remove and discard the casings from the Italian sausage. Put the 6 quart pan on the stove and heat it for about 60 secs. Add the olive oil and then the sausage. Break up the sausage as it browns. Add the onions, garlic, peppers and mushrooms when sausage is about half cooked. When onions become translucent and mushrooms begin to yield their liquid, add the wine and seasonings. Let this simmer for about 5 minutes. 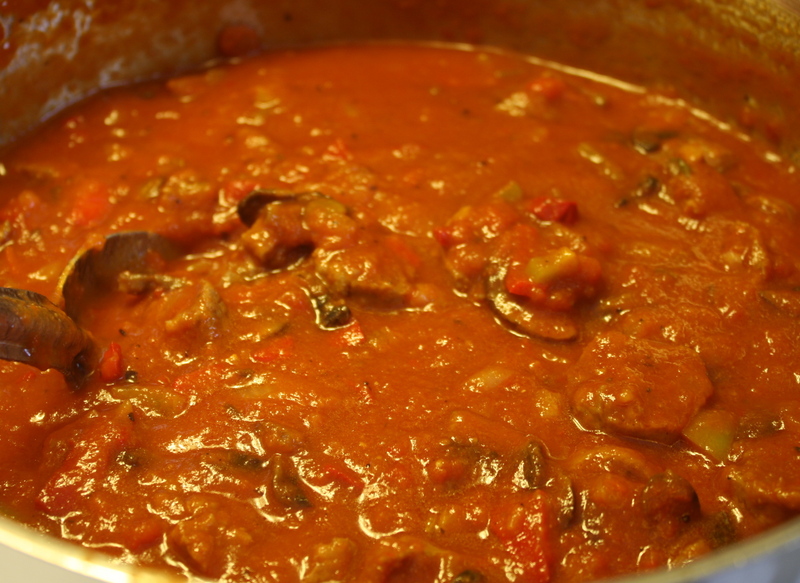 Add your spaghetti sauce and stir. Heat until bubbling. Turn off heat. First put down a layer of your sauce mixture, then sprinkle on your uncooked pasta till the sauce is almost completely covered, next sprinkle on about 1/2 cup of the shredded cheese. Repeat until casserole is almost full. 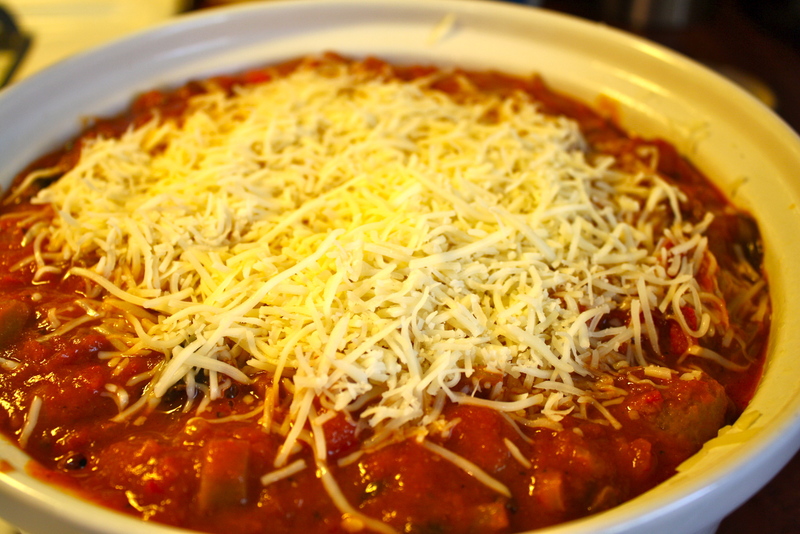 Your top layer should be sauce, pasta, sauce and last cheese. 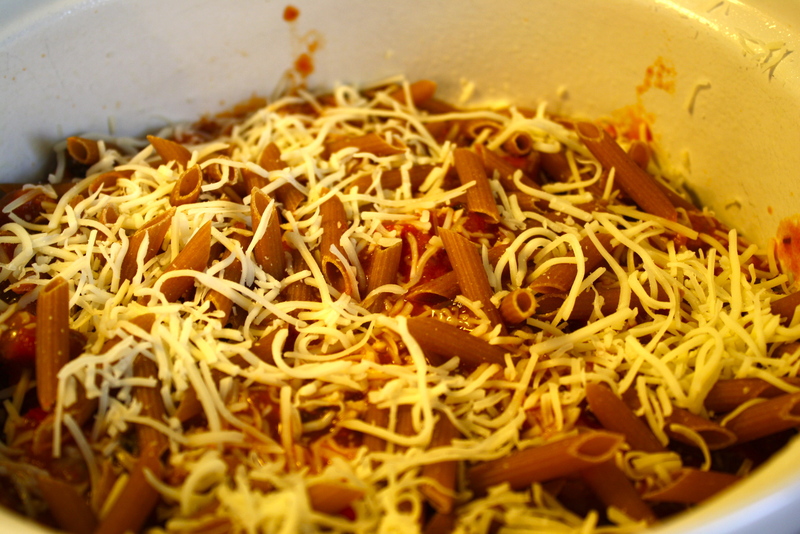 Put the cover on the casserole and bake for 45- 1 hour until pasta is tender. Remove and let cool for about 10 minutes. This allows the juices that rise to the top to be reabsorbed. Think of it like letting a roast rest before serving. Serve with with a crusty bread. Enjoy!